Wisconsin is the only state in America which allows in-state bear hunters and others from the other 49 states to come to the picturesque North Woods and let their packs of hounds run loose to chase bears in so-called training runs for a bear hunting season that does not start until next week, and could see 3,000 or more bears killed. Wisconsin Department of Natural Resources records show that 28 bear hounds have died in this gruesome fashion this year, and a stunning 25 of these hounds have been killed just this month. 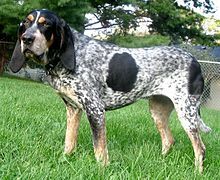 A five-year-old female Bluetick in Iron County, like the one pictured below, was the most recently-reported hound killed by wolves in Wisconsin. The bear hounds are allowed to run through known territories of bigger, stronger wolves, even through areas where the wolves could be attracted by bear bait left behind legally by the hounders, and for years, Wisconsin has been paying hounders $2,500 for each dog which inevitably dies a gruesome death in confrontations with the bigger, stronger and very territorial wolves. Let's look at the bigger picture. ...because legislators and regulators are in thrall to aggressive, one-track gun and hunting lobbies which treat public wildlife as their disposable, personal property - - even enabling bear-poaching in excess of the thousands of bears shot here legally after being run up trees hounded literally to exhaustion. More disregard for Wisconsin wildlife begins July 1, when "hounders" - - hunters using dogs - - will be allowed to let loose their GPS-equipped dog packs on bears for training purposes before the actual bear killing season begins in the fall. Wisconsin hunters are also allowed to train their dogs against a variety of living, captive, caged wild animals. And, yes, there are requirements in the state rules to protect the caged wild animals from injury or death during the dog training...but who is around to monitor and enforce those rules' effectiveness, given that DNR wardens are spread awfully thin statewide, and the training periods can legally run up to 18 hours a day? Who will actually make sure, for example, that a hunting dog is not allowed to get closer than one foot to a caged bear - - yes, that's the allowable practice - - or that if the cage is hoisted in the air for training purposes, it has to be 10 feet off the ground? And that throughout the hours and hours straight of such hoisting and dodging and other movements that the caged bears are given the food and water and rest they are supposed to have. Another Scott Walker "economic success [Sic]"